In the first trailer for Disney's live-action "Aladdin," Will Smith makes his first appearance as the shirtless, muscular, and very blue Genie. Last year when pictures of Will Smith as the Genie in Guy Ritchie's live-action "Aladdin" surfaced, we were left with two big questions: First, what are the mechanics of his ponytail? And second, is Smith going to be blue or not? 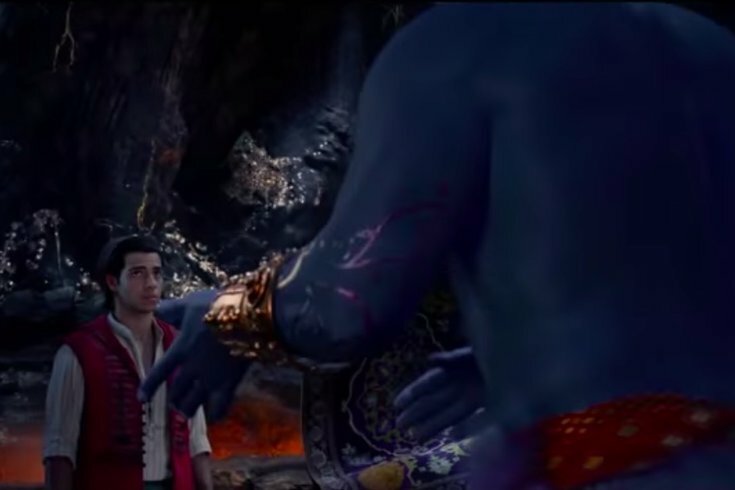 While the first question may always remain a mystery, the latter was officially solved Sunday night when a new trailer was released for the movie, with Smith appearing at the very end to shock and delight the masses, sort of, as the floating, muscular, and, yes, extremely blue, Genie. You'll even hear Smith make his signature "Woo!" just before appearing. Though the trailer was just released during the Grammys last night, Twitter has, of course, provided much feedback on Smith's Genie. So, it seems like the initial reaction to the genie is one of ... fear? Confusion? Regardless, we have some time to get used to it before the movie is released on May 24. Check out the full trailer below.